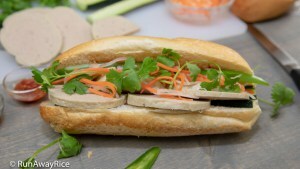 Carrot and Papaya Pickles (Do Chua Ca Rot Du Du) - Easy Recipe with Video! I am sharing a tasty Carrot and Papaya Pickles (Ca Rot Du Du) recipe that is quick and easy to make. These refrigerator pickles are my go-to recipe and I use seasonal vegetables to enjoy homemade pickles year-round. 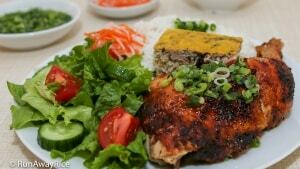 If you haven’t tried green papaya, you’re in for a delectable treat. Green papaya is mild-tasting, crunchy and refreshing making it a perfect ingredient for pickling. These Carrot and Papaya Pickles are a wonderful alternative to the traditional Vietnamese Carrot and Radish Pickles (Do Chua). Enjoy these amazing pickles in sandwiches and dipping sauces, with savory cakes and rice plates or as side dishes to complement savory foods. 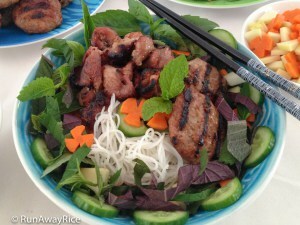 Use green (unripened) papaya for this recipe. 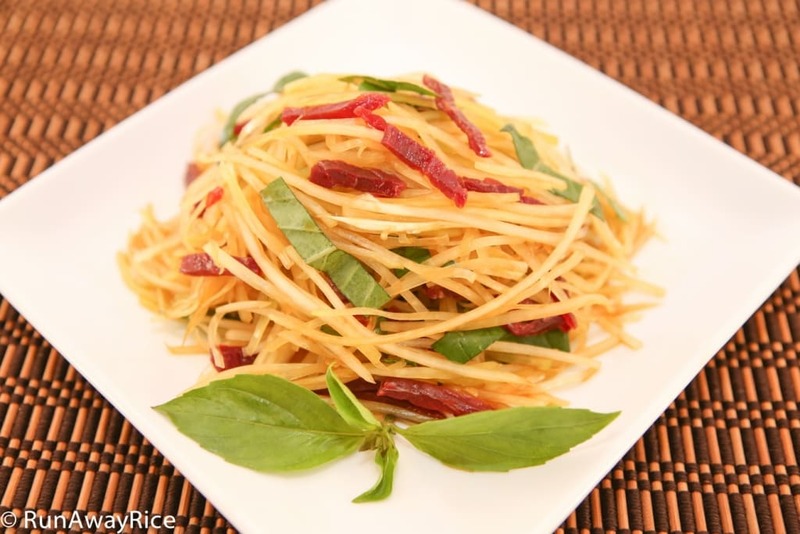 Green papaya is crunchy and mild-tasting unlike the ripened fruit which is soft, fleshy and sweet. A green papaya is the same as the orange papaya. It’s simply unripened. Green papaya has smooth dark green skin. Pear-shaped, it’s closer to the size of a small pineapple. 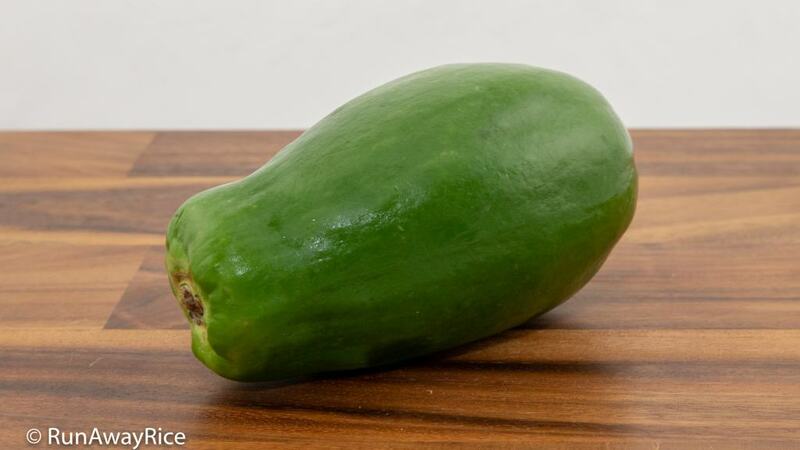 An average green papaya weights about 1 1/2 – 2 pounds (680-910 grams). For this Carrot and Papaya Pickles recipe, you’ll need about one-third of a medium papaya. 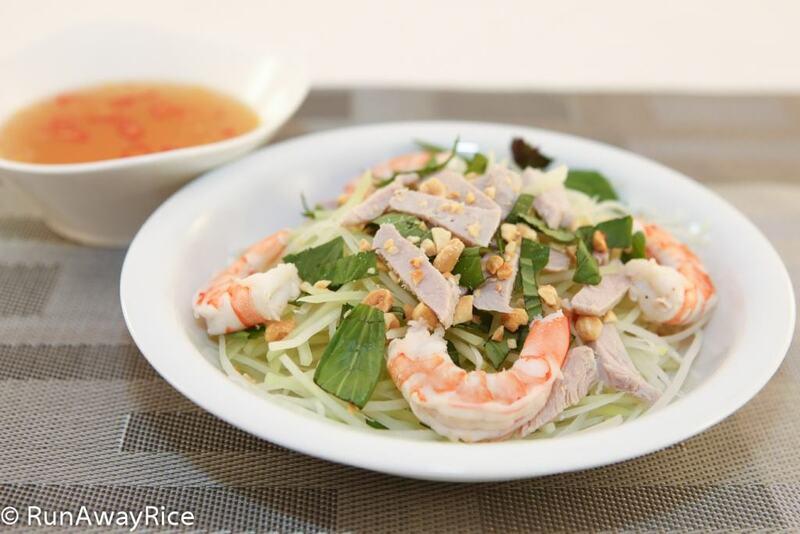 You will mostly likely have some green papaya leftover so use it to make Papaya Salad with Shrimp and Pork, a light and refreshing salad. 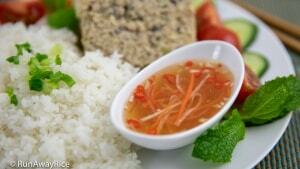 The taste of a green papaya is like a cross between an unripened pear and green cabbage. It’s crunchy and refreshing making it an awesome fruit to enjoy raw, as in this pickles recipe, or in a salad. 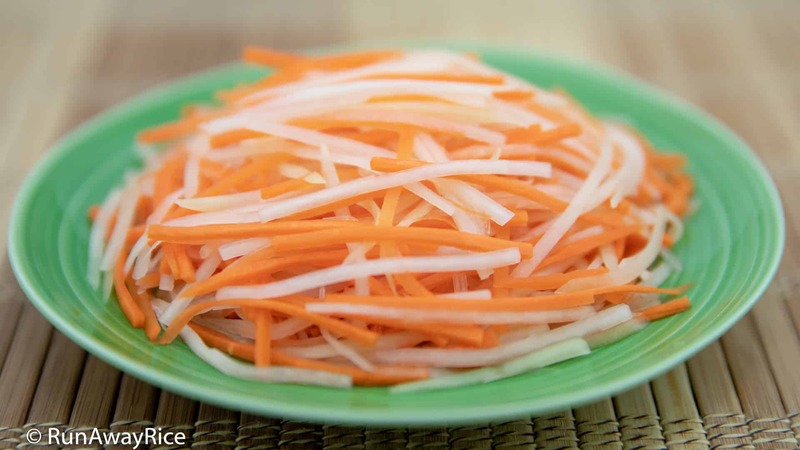 For those who find the Daikon radish in Carrot and Radish Pickles (Do Chua) too pungent, you’ll love the mild taste and aroma of green papaya. Green papaya is native to Mexico and South America but also grown on tropical Asian climates. 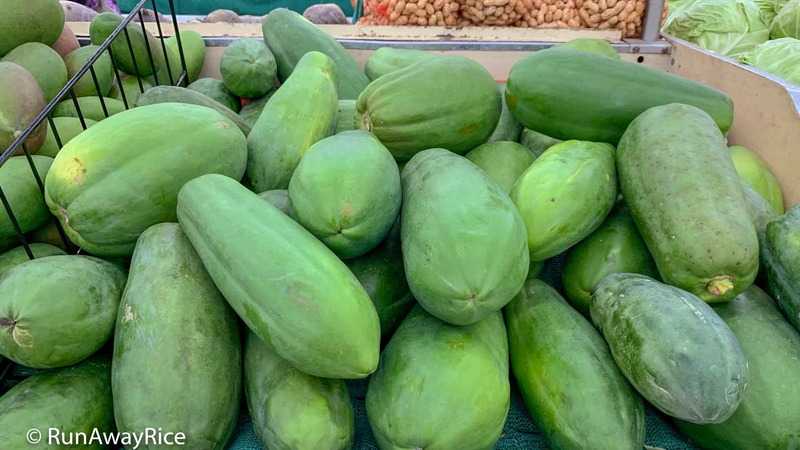 If you live in southern California, green papayas are abundant and easy to find in American, Asian and Latin markets. They are moderately priced, about $.80-1.25 per pound. When buying green papaya, select one with shiny, dark green and unbruised skin. The fruit should be firm to the touch. Avoid green papaya turning yellow and having soft spots. 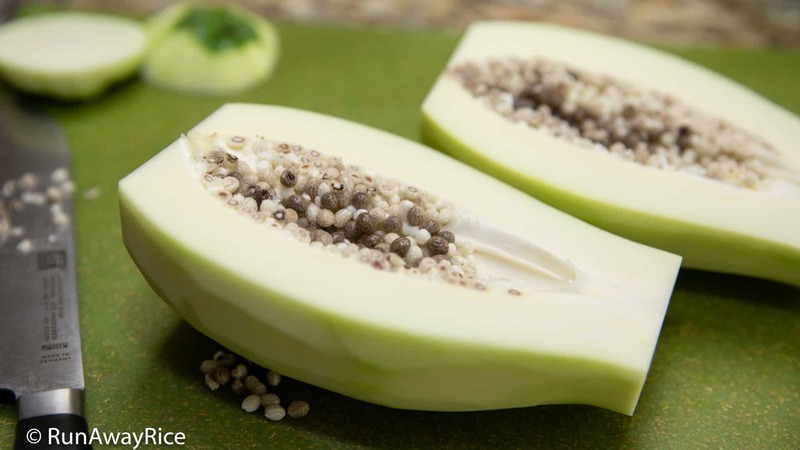 After bringing the papaya home, store it in the refrigerator and use it within the week. If you’d like to keep it longer, here’s a tip: Wash and dry the papaya well. Wrap the papaya with a paper towel. (This helps to absorb any moisture from being refrigerated.) Place the papaya in a produce bag and store in the fridge. It will stay fresh for up to 2 weeks using this method. Give it a try. You’ll be surprised how fresh it remains. When making the Carrot and Papaya Pickles, I like to use the larger carrots. 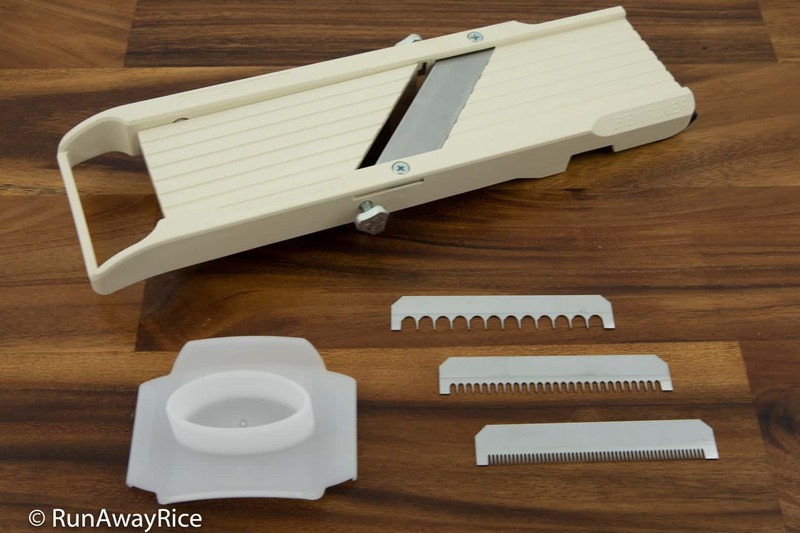 It’s easier to shred a thicker vegetable with a mandoline. You may not use the entire carrot. Save the leftovers for salads or soups. The flesh of a green papaya is slightly sticky, having a sap-like coating. 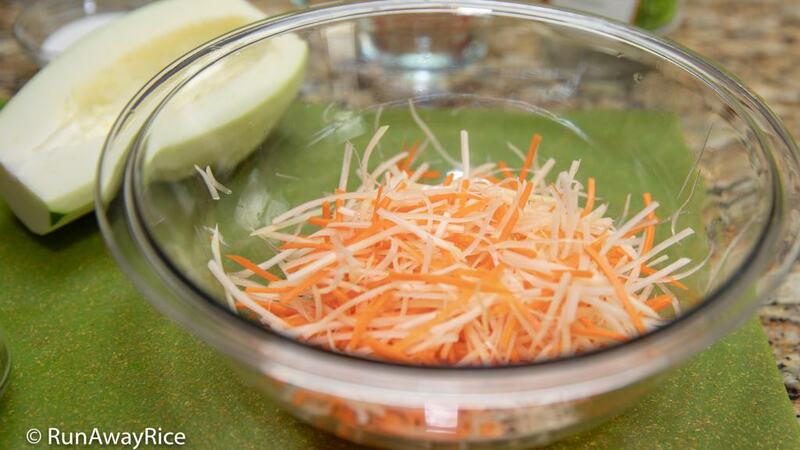 It’s important to soak the shredded green papaya in cold water for at least 15 minutes to remove this sap. After soaking, drain well, then use a salad spinner to remove any excess water. Alternatively, place the shredded papaya inside a clean kitchen towel and twist the kitchen towel a few times to wring out any excess water. Soaking the green papaya will enhance the texture making it taste lighter, juicier and more refreshing. I use equal amounts of carrot and green papaya but feel free to adjust to your preference. Some people prefer a bit more green papaya than carrots. Since you’re making it, it’s entirely up to you! The pickling solution is also very customizable. This is a base recipe so feel free to adjust the acidity or sweetness to your taste. 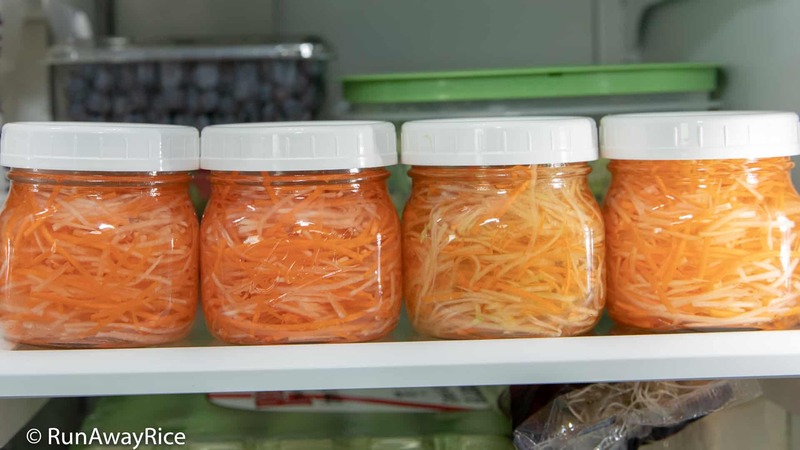 Use 2 (1 pint) jars (or 1 large jar) to store the Carrot and Green Papaya Pickles. In each jar, put about 4-5 ounces shredded vegetables. Don’t pack the veggies too tightly. Leave room for the pickling solution to marinate the vegetables. I am sharing a tasty Carrot and Papaya Pickles (Ca Rot Du Du) recipe that is quick and easy to make. These refrigerator pickles are my go-to recipe and I use available seasonal vegetables to enjoy homemade pickles year-round. If you haven't tried green papaya, you're in for a delectable treat. Green papaya is mild-tasting, crunchy and refreshing making it a perfect ingredient for pickling. 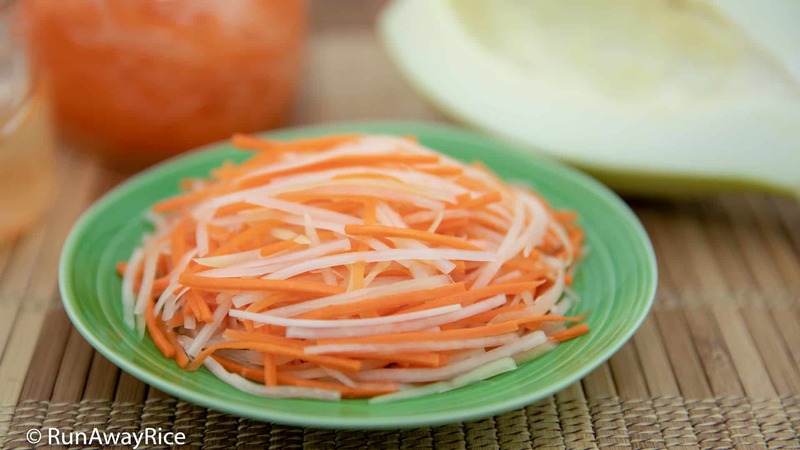 These Carrot and Papaya Pickles are a wonderful alternative to the traditional Vietnamese Carrot and Radish Pickles (Do Chua). Enjoy these amazing pickles in sandwiches and dipping sauce, with savory cakes and rice plates or as side dishes to complement savory foods. 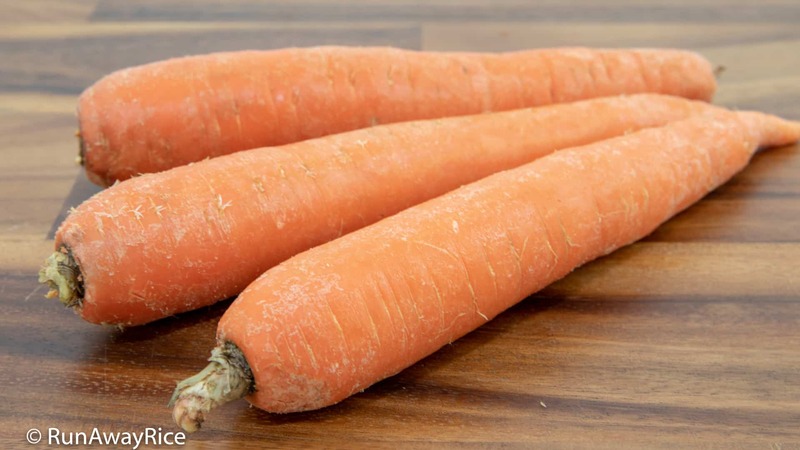 Remove the skin from the carrot and papaya using a vegetable peeler. Rinse the vegetables with cold water and pat dry using paper towels. Cut the carrot into sections about 2 1/2 - 3 inches long. Cut the papaya in half lengthwise. Use a spoon to scoop out the seeds and discard. Cut the papaya into sections about 2 1/2 - 3 inches long. Trim off any remaining core membrane and discard. Shred the papaya into a large bowl. Use your fingers to separate the shredded papaya. Fill the bowl with cold water and let the papaya soak for 15 minutes. Drain the water. Use a salad spinner to remove any excess water. Shred the carrots. Toss together to combine the vegetables. Use approximately one-third of a medium papaya for this recipe. I never realized papaya had sap and you had to soak with water to get rid of it. No wonder my pickles were always a bit slimy and I never understand why until now. Light bulb! 🙂 Thank you for sharing your knowledge in these recipes. I am glad you found the recipe and tips helpful! Yes, soaking the papaya is the key to getting rid of the sap. You can definitely soak longer but 15 minutes is the minimum. Enjoy!